This week’s TNA iMPACTt! set the stage for two monster storylines right off the bat-the fallout from Mr. Anderson’s surprise victory over Jeff Hardy for the TNA World Heavyweight title and the conclusion of Jeff Jarrett’s underwhelming MMA angle. OPENING SEGMENT. The broadcast opens with a bright-eyed Jeff Jarrett stepping out of a limo with his wife, Karen Jarrett, in tow. At this point I will take anything other than those lame and disjointed MMA exhibitions that someone in TNA corporate thinks is cool. Cut to the Impact Zone and we are treated with a well-deserved Mr. Anderson promo, his first since winning the TNA title on Sunday. There were some high parts of the segment, including Anderson ranting about his stint in WWE and how he was asked to tone down his quirkiness at times. One particularly weak moment worth mentioning was when Anderson said the name Bischoff and he had to wait a couple of seconds for the seemingly tired crowd to begin jeering. Matt Morgan came out to claim a good chunk of Anderson’s victory, which made little to no sense. At TNA Genesis on Sunday, Morgan and Anderson wailed on each other for a good 15-20 minutes, and the only damage Morgan did to Hardy during the title match was clothesline him. Weak angle, TNA. At some point, Eric Bischoff came out and announced a rematch between Hardy and Anderson for the belt on February 3rd at Impact!. Later, Jeff Hardy came on the big screen to talk his noise, but was quite rudely interrupted by Rob Van Dam planting a flying forearm across his dome. Cue Anderson, Matt Hardy, and the rest of Immortal to brawl backstage and you have an opening segment that’s way too long. At these Impact! tapings right after PPV’s, wouldn’t it serve TNA to start the night with a match right off the bat and have the announcers do a mini-recap of the PPV during the match? Mike Tenay and Taz already banter enough as it is about pigeons and whatnot; can’t they at least let us know who won that surprise match between Matt Hardy and RVD, or what the result of that clash between Bully Ray and Brother Devon was? BEER MONEY Vs. MOTOR CITY MACHINE GUNS. Finally, wrestling, and a title match to boot. A rematch from Genesis, Motor City showed why they are still the best tag team in TNA, but not before cutting a quick Q-n-A right before the match started. In it, Alex Shelley dropped a reference to getting kicked in the mouth by his teammate, essentially costing them the belts. Sure enough, after a well scripted match between the two, Shelley accidentally returned the favor on partner Chris Sabin and delivered a superkick to Sabin’s face, leading to a Beer Money victory. POPE SEGMENT. 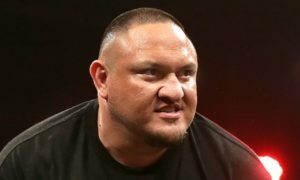 The Pope comes out next to gather some cheap heat from Samoa Joe, who has been “spying” on Pope and claiming donated money has been going to strip clubs and gambling. The Pope rambles on about this and that before directing fans to the “Dixie-tron” (nice) and telling us he caught Joe and his wife making love, and up pops two rhinos mating. His second joke isn’t even worth mentioning, because it all but killed the humor of the first gag. Overall, this was still eons more thought out than Kazarian’s deplorable bit on Jay Lethal’s family two weeks back. RVD and KEN ANDERSON BACKSTAGE. Throughout the evening, Rob Van Dam and Mr. Anderson had been pacing through the backstage in preparation for their tag team match against the Hardys later that night. They ended up finding Beer Money in their locker room and pulled off a somewhat comical bit where the door slammed shut and all we could hear was RVD and Anderson beating the crap out of the tag team. Good stuff. JEFF JARRETT – KURT ANGLE SHOWDOWN. Didn’t Jarrett promise a ceremony at Genesis? As per most of the stuff Jarrett has been involved with lately, this was a waste of time. Jarrett and his Goon Squad come out to introduce his wife Karen, but when the music drops Kurt appears and demolishes all SIX guys on Team Jarrett. Before Angle can reach his target, Karen Jarrett comes out to tell us how big of a jerk Kurt is and that we will hear “her side of the story”…next week. This lame teaser and Karen’s horrible acting skills only compound my frustration over this angle. I could really care less what she has to say next week, but I’ll be damned if she didn’t look amazing in that dress. ANGELINA LOVE and WINTER Vs. MADISON RAYNE and TARA. In other words, two-thirds of the Knockouts fighting for two of the three belts available. In what could be a volatile situation, Love’s other partner Velvet Sky, expressed her concern over Love’s relationship with Winter, which more or less came off as jealousy. You didn’t take much from this match other than that the writers continued to develop Winter’s insane personality, capped off by a sweet sleeper hold applied to Tara after Mickie James chased off Madison. By the way, this was the second match of the evening, a whopping hour and twelve minutes into the two hour show. ABYSS with RIC FLAIR Vs. MATT MORGAN. You know right away any match with Abyss is going to be slow, so WHY IN THE HELL would you put him up against the only guy bigger than him? Snore. Morgan wins after a Carbon Footprint, but in typical TNA fashion Immortal storms the ring to beat up Morgan. Also, why do the announcers keep referring to Rob Terry as the Immortal enforcer? Isn’t that what Abyss is for? HARDY BROTHERS and CRIMSON PROMOS. This is worth noting-before the Abyss match, Matt and Jeff cut a promo behind a chain link fence and dropped this one-liner: “our bloodline…is immortal!” Wow, fellas, you write that yourselves? After the Abyss match, the Monster is attacked by a figure who calls himself Crimson, but we recognize him as the wrestler who portrayed Amazing Red’s younger brother a couple weeks back. He tells Abyss that “They” are coming. My bold prediction: a faction of only red-headed wrestlers called “The Ginger Dead Men.” C’mon, TNA, do it. ROB VAN DAM and KEN ANDERSON Vs. MATT and JEFF HARDY. On paper this would seem like a solid match, but before the match even starts Anderson is busted open and Matt Hardy just…is. He looks terrible and these two no longer have the cohesion that we were used to in the late 90’s. For a main event, this was disappointing. The short bout was interrupted by yet more Immortal guys coming to the ring to attack RVD and Anderson. What the hell, are these guys breeding or something? VERDICT. 5/10. Four matches in two hours! Step it up, TNA. Television, especially Thursdays, has been getting real good lately and episodes like these are how you lose viewers. Joe Leininger is based out of Gainesville, FL and writes on The Playing Field.